It’s (almost) the most wonderful time of the year, and you know what that means: it’s time to keep secrets and hide things from your loved ones! It’s not weird if you’re doing it for magical holiday surprises! We can’t stress the importance of the magical holiday surprise enough; have you ever been given a present and had to pretend you were surprised by it? It’s so stressful. You don’t want to do that to a family member–that’s no gift at all. “Storing” your gifts somewhere out of sight will be especially important if you have children of a certain age. These “explorers” would love nothing more than to ruin their own holidays by sneaking early peeks at their presents. You can’t let this happen! Here are a couple ideas for holiday hiding places clever enough to outwit even the most dedicated present plunderer in your house. This is a classic move. Little kids love to do that thing where they grab presents and shake them to see what’s inside. They can’t be bargained or reasoned with when they get that shiny look in their eyes; those boxes are going down. Luckily, kids also have stubby little arms. 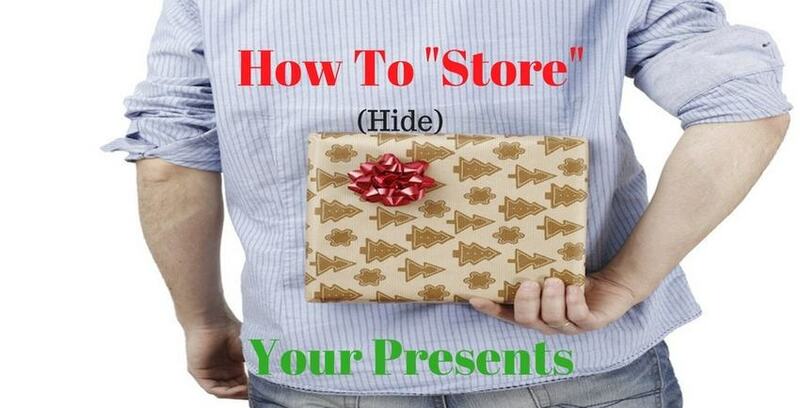 Hide your presents in the top shelf of a kitchen cabinet or high up in your closet. Put them in that cupboard above your fridge where you keep the matches. The harder to get at the spot, the better a present-storage place it will be. Little kids with unlimited energy won’t be able to reach it; older kids will get lazy and give up. Remember, though, high places are usually the first place present-peepers think to look, so these spots are more deterrents than they are true hiding places. If your rascals are particularly inventive, a different strategy may be necessary. The trick to a good, classic hiding place is thinking of the last place anyone would expect. Put your presents somewhere their recipient would never think to look. No one’s touched that box of keepsakes in the basement for over a decade. No one even knows why you all keep that old filing cabinet around. If you’re afraid a desperate holiday hunter will figure out a way to get at out-of-the-way presents, try hiding them somewhere they can access easily, instead. Maybe you have a shoe closet which no one actually ever uses even though you’re always telling them to. Maybe there’s a garbage can in the guest room that no one ever empties. If no one thinks about places like these the rest of the year, there’s no reason they’d start thinking about them now. Be careful with this hiding strategy, however, as classic hiding places are the most fun places to seek out. You don’t want to make any more of a game out of “find your presents early” than it already is. Now that we have the basics out of the way, it’s time for some advanced maneuvers. Maybe you’ve tried the most clever hiding places you could come up with, every time to no avail. Maybe you’re overthinking it. What about hiding in plain sight? Your kids can’t wait to tear into that PlayStation 4, but they’re not particularly interested in the microwave box you brought in from the car the other day. Disguising presents works particularly well if you can disguise them as something would-be peepers want nothing to do with. This overlaps a bit with an even more advanced technique below: “the vinegar pot.” Nobody’s going to go looking for whatever new-fangled techno-product kids are into these days in a box of feminine products. Now we’re getting into the interesting ones. The present-hiding tradition is a psychological chess match. You’re not just stuffing a new iPhone into an underwear drawer; you’re outwitting and manipulating your opponent! Enter: the Honey Pot. The Honey Pot is a decoy gift–a false flag operation designed to distract and deter. While your opponent diligently tracks down the breadcrumb clues you carefully designed for them, inching closer to the decoy with each passing day, you’ll have hidden away the gift in a different, more obvious hiding place. The problem is, they’ll be so busy trying to unravel your tapestry of misdirection that they’ll never think to look in the obvious places. When these holiday detectives finally track down the gift they’ve been after for weeks, they’ll rip away the immaculately wrapped paper to reveal… a shoebox full of coal?! Meanwhile, the real present is nestled safely away, unmolested by greedy gift goblins. You win this round! The only possible downside to this technique is the psychological toll it might take on its victim. But, you know, isn’t that really what the holidays are all about? The reverse honey pot, affectionately called “the vinegar pot,” is perhaps an even more psychological masterwork than its original variation. The secret here is hiding the presents somewhere their recipients really don’t want to go. Put your son’s new 3DS in his older sister’s underwear drawer (cooties!). Put your husband’s new golf clubs in that home project he’s “going to get to eventually.” Put the lego set at the bottom of your kids’ dirty clothes hamper. Once the gift is placed, you have to help spring the trap. Whenever you see your kids creeping around, you have to make it clear that you will be on them. “Oh, you were digging through your bathroom cabinets earlier, I saw,” you’ll say over dinner, “so why don’t you scrub out the toilet and clean your shower while you’re down there?” Use your families’ neglect against them this holiday season. It’s poetic justice. Like the honey pot, the only problem with this is it might make your family bitter (get it? Because it’s vinegar?). You don’t want to be having a light-hearted holiday time and then suddenly get into an argument about how someone never puts their dishes away or makes the bed. You still wanna feel like giving presents at the end of all this. Finally, you’ve got us. The ace in the hole. The final move. Checkmate. With one of Storage Direct’s facilities, you’ll be able to store any presents, no matter how numerous, large, sensitive, or weird. We don’t do contracts and have a minimum rental time of only two weeks, so you can keep your presents safe with us for the holidays without having to worry about a long-term investment. We’d like to see a present thief get past a gate code and locked garage stall door to which only you have the key! That would be the holiday heist of the century. And it ain’t gonna happen. If you want the ultimate present-hiding place this year, just pick out the size that works for you and we’ll set you up. Happy Holidays!